"Thank you for making us all look so lovely. I will definitely call you for upcoming occasions." "It most the most amazing day, I wouldn't have changed a thing & everything ran so smoothly, just wished the day hadn't gone so fast!! And thank you again for our beautiful makeup, it was perfect, & I will definately be recommending you to all my friends!" "Hi Eve, Just wanted to say you did a fantastic job on my wedding day. Everyone loved their makeup. " "Thank you again for making us all look beautiful on the day." 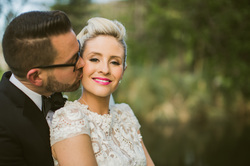 "Eve did a fantastic job on my wedding day- I could not have asked for more! After one failed trial with another make-up artist I was nervous about finding someone I was happy with but Eve put me totally at ease during the trial and on the morning of the wedding. She took the time to listen to what each of us wanted and the results were perfect for myself, my mother and my bridesmaid. She also stayed and helped with the flowers in my hair and fixed my bridesmaid's hair too. I would definitely recommend you to any future brides. Thanks Eve!" "Hi Eve, I Just want to say thank you for the great job you did with my makeup last Saturday on my daughter's wedding day.Danielle and my husband loved it and I looked flawless in the photos. Danielle and the girls all looked beautiful. You did a great job.We had an amazing day.It was a pleasure meeting you. Thank you once again." "Just writing to say a huge thank you for our makeup for the wedding- it was absolutely perfect and it lasted the whole day and we received so many compliments on it. It was also a pleasure to have you do our makeup- you are just so friendly and relaxed and that's just the kind of energy a bride needs on her wedding day!"